Day 253 - Happy Halloween! It's time to 'Frick or Freat'! (that is what a little kid with a speech impediment might say). Maybe you don't NEED a costume - maybe you have a built-in costume if you REMOVE clothing. That is SOOOO scary! 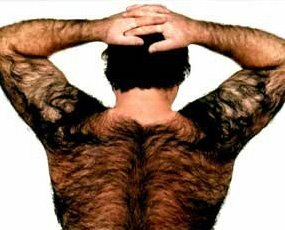 This photo is not at ALL what I planned to post on Halloween, but if you want to see a human werewolf, or Sasquatch candidate, here he is! Need a rug? He's your man! Drat - it's going to RAIN this afternoon. 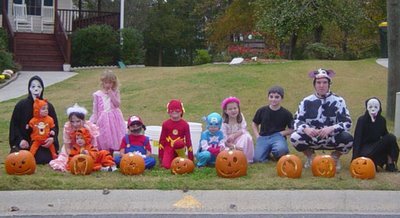 Poor little kids - you wait all year long for Halloween and then it RAINS. Remember, October is our DRY month and it's going to RAIN today. 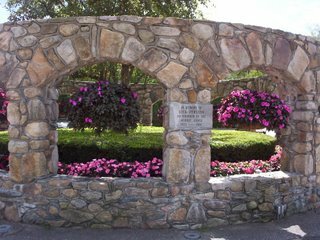 After I had children, we would drive to 'Grandmas neighborhood' in the prestigious Blackstone Boulevard area of Providence so the kids could go trick or treating there - the candy was better and the homes were GORGEOUS. Remember people used to invite you inside and take your picture if you were 'cuteness personified'? I'll bet they don't dare do that now - parents would sue. I left for a business trip the day after Halloween. Unbeknownst (is that the right word?) to me, someone had driven by during the night and thrown raw eggs against one side of my car, which were now frozen solid to the door and side of the car. 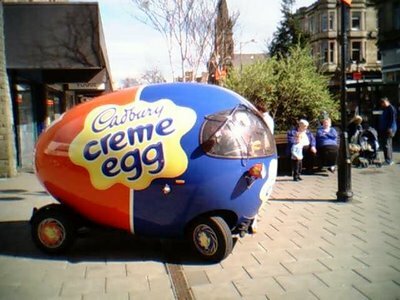 I didn't have time to defrost frozen egg white and wash it off, so I drove to the airport parking lot and left the car there a week with egg on it. YUCK! 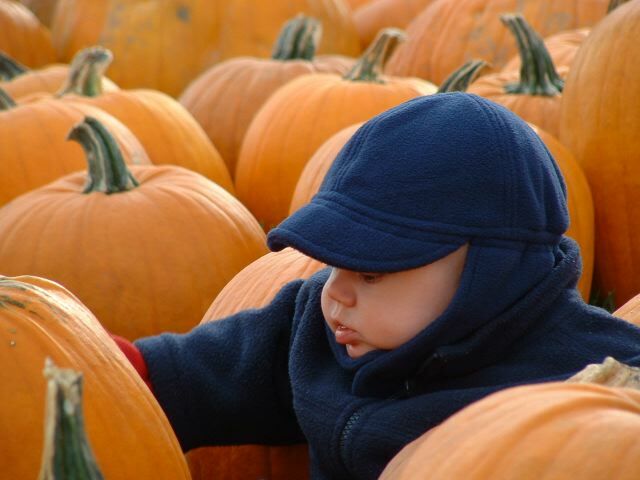 Have a safe and delicious Halloween, everyone! Eat some candy for me! 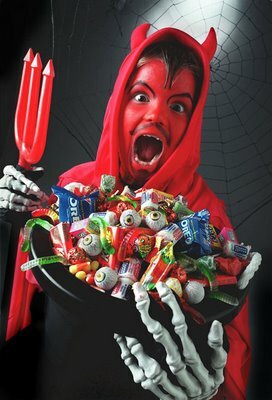 Enjoy the cute little trick-or-treaters, and move the juvenile delinquent and teenaged ones along as soon as possible! Day 252 - Halloween Eve - Get Your Stocking (Masks) Ready! Have you been SCARY girls and boys this year? You have? Good! Yes, I did pick up some candy this weekend. A small pack of Baby Ruth bars, some Tootsie Roll pops, and I still have a few Halloween pretzels left. Did I tell you that once we started eating them, the Halloween pretzels were shaped like bats and Jack O' Lanterns? Cute! I think pumpkins are fun to carve, but I didn't buy one this year. Oops. Well, if it counts, I did buy a decorative glassware pumpkin bowl for the mantlepiece. It's supposed to be 75 degrees this afternoon. Awesome. I have short sleeves on, and I guess I'll just wear a light sweater. Now THAT's fall weather. We'll have our trip after work tonight to Cracker Barrel with another couple. Charlie asked me this morning 'So - whatcha gonna have tonight at Cracker Barrel?' We think about it all day but we don't decide till we get there. I usually get fish, grilled chicken tenders, or salad. But you know that already... It's almost quarter past 6, I hope Blogger cooperates this morning and I can post 'da blog' on time. Have a nice day, even though it's.... MONDAY.... TTFN! Day 251 - Hey! It's Light Outside at 6am! I wrote this blog entry this morning but blogger wouldn't publish it. Sorry to have such a late posting but I've been out of the house all day. Charlie and I are watching football and eating Edy's light butter pecan ice cream with sliced bananas on it. Heaven in a bowl!!! Did you set your clocks back last night? We've only set ONE so far. The cable box and the computer and the VCR and the cell phones reset automatically. I need to set the stove and the microwave. We have one CD player that's always set on 'blink', because every little power glitch sends it into a spin. We ignore that one. I have two plastic grocery bags in my car full of books that I bought at the library's book sale yesterday, and no room anywhere for them. I need another book case. I'll have to do some creative shuffling and make room for them somewhere. Can I put a book case in my car? 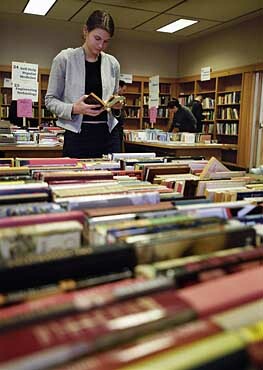 Get out your calculators - all the books at the book sale were 50 cents each, and I bought 10 dollars worth, which means I bought 20 books. I got one book for work (ActiveX and VBscript), one book for a gift, a few childrens books to put away in my 'Childrens Book' stash, and a bunch of sci-fi/fantasy books for ME ME ME. I ran a bunch of other errands yesterday, successfully, and there was NOBODY in the pool except me. BLISSFUL. No, I didn't lose my noodles. It was REALLY windy yesterday - a lot of the leaves are off the trees now. Looks wintry! There were several WOMEN at the gym yesterday (very unusual), but no men in sight. Then I realized football was on, and that's why there were only women at the gym yesterday afternoon. Well, I'm going to go have breakfast with Charlie, then I'm going back to swim some more and Charlie's going to do 'man stuff' while I'm running errands. TTFN and have a lovely Sunday! 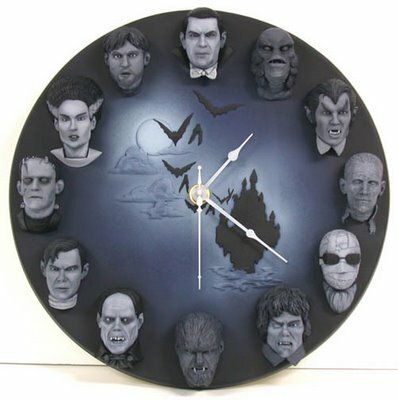 Here is an awesome clock with a Halloween theme. Boo! They should make a Halloween cuckoo clock - instead of a Swiss Chalet it would look like Draculas castle. When it chimes, bats would come out and flap their wings, then go back inside. Don't forget to turn your clocks back tonight! We'll enjoy an extra hour's sleep, but it's going to get dark early starting tomorrow! Halloween is almost here, and I only have Halloween pretzels to give out. I need to get some CHOCOLATE too! We only have a few kids that come to the house, so I don't need to get a lot of candy delicousness. Repeat - I don't need to get a lot of candy. Repeat- I don't need to get a lot of candy. I am overhearing snippets of conversations in a store or at work that mention Christmas. They are already talking about Thanksgiving and Christmas events and potluck lunches at work. I'd better get shopping... or at least get a clue regarding what I need. The 'heat and air' man is coming over this morning to do the fall clean-and-tuneup. Maybe I'll go clean the front storm door which has a coating of dust on it. Maybe I won't. I'm going to the book sale, then dropping off some stuff at Goodwill, then picking up my dry cleaning and leaving more dry cleaning, then going to the dollar store, then going to swim, then going home. Sounds like a totally full day, doesn't it? You have a nice day, and start making those Christmas lists! TTFN! I am going to Blog and Go this morning - my group is meeting for a Team Breakfast at 7:30am. Yahoo! I like going out to breakfast (of course)! I even had a manager at my old job (BT) for a while who took us to breakfast pretty regularly. 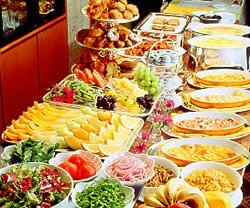 We'd go have a breakfast buffet, get custom-made omelettes cooked by 'Miss Chris', talk about what we were working on, and it was just a lovely work event! It's raining. It rained gently for most of the day yesterday, and it's going to rain all day today. Of course, it didn't rain almost all summer, and October is supposed to be Tennessee's dry month. Who comes up with this stuff anyway? If it's gonna rain, it's gonna rain. Get over it. Hey, I have an Uncivil comment to make to Civil Engineers. Will you please design a bloody turn lane to handle more than THREE cars? Around Cool Springs, we have THIRTY cars in line to make a turn, and none of the bloody turn lanes are more than a few feet long, resulting in bottleneck after bottleneck. Makes you want to drive in the bloody median. Even the turn lanes for the INTERSTATE are too short! Good grief, people! Will you please change the bloody specifications on that bloody piece of computer software that plots out that crap? Thank you. Have a nice day! Love you Bye! It took me 50 minutes to go 18 miles last night, but I made it home with the pizza in time for Survivor! Day 248 - Thursday and Survivorage! Greetings, o' Thou of Sound Mind and Faint Blogginess! Halloween rolls ever closer - have they shown 'Great Pumpkin' yet on TV? My work area *might* have been a tad cooler yesterday. I didn't off take my jacket-that-goes-with-my-blouse until the afternoon. Guy-who-sits-behind-me wasn't impressed with the difference, and now two people are complaining the extra air flow dries their eyes out. Sigh. I'm drinking my bloggy juice this morning with a speck of French Vanilla flavored Splenda - I wouldn't use the whole packet because it has a pretty strong 'fake' scent about it. Tonight I think I'll go by Publix supermarket and get a pizza to go - there are two Publix stores near my workplace, but only one of them has a pizza oven. It seems odd to have a pizza oven inside a grocery store, but since I really like their crust I am all for it. Speaking of Pizza - over in the Stewarts Ferry area of Nashville there used to be the BEST pizza place named the 'New York Experience'. They would make a tabletop-sized 'giant pizza' that could only be consumed on the premesis because it was so huge it couldn't fit in a box. I surely miss that place. Well, now that I'm hungry I'd better be thinking about breakfast and work! TTFN and have a great Thursday! Charlie and I are having a good laugh over it, and so is anyone sitting within earshot. Anyway - the area I work in is too hot. We are having way-below-normal temps at the moment, and I have to wear short sleeves where I sit because it's HOT. I've mentioned it several times at work, and said ONCE 'Even my palms are sweaty' when it was true! The guy who sits behind me has been suffering too, and suggested I send an email to the facility management people. I didn't bother. The folks working around me who have heard (one way or another) now walk by my cube and casually remark 'it's hot in here'. Another guy sent me some different words for 'sweaty', like 'diaphoretic' in case they are more palatable. Another lady came by to warm up - her area is too cold and she heard ours was warm! I hope I can get over my new-found reputation of 'Ms. Pete Schweaty'. Yesterday, a guy came over with a ladder and worked on the vents, increasing the air flow which may disperse the heat a little better. We'll see how it is today. Well, I can't say much more on that subject, except to proclaim to the world that I don't have to SWEAT to be too hot, and if I have a hot flash, I'm going to keep it to myself! Do you mind if I use the same caption over again? 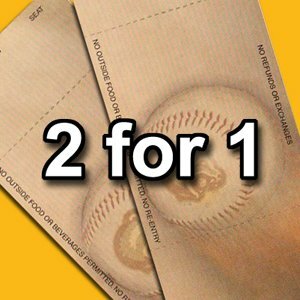 When I think of Tuesdays I think of 'Two-for-Tuesday' drink specials and things like that. It is a bone chilling 29 degrees but I am safe and warm with my fuzzy slippers on that I bought last winter when I started blogging! How about THAT? Our weekly pilgrimage to Cracker Barrel was really good last night. I had catfish, carrots, applesauce, a side salad, and cornbread muffins. Charlie had a sampler that included meatloaf, chicken and dumplings and country ham with mashed potatoes, corn, green beans and cornbread muffins. It was DEEEEELICIOUS. Dream update - I can't remember what I dreamed last night. Sorry! Blogcabulary word of the day: Can't think of one right now. Sorry! Hey speaking of the last word - nobody's been commenting on my blog, so maybe nobody is reading it. Especially MONDAYS. I could free up a lot of time for myself, you know. TTFN and have a nice Tuesday! The lights look like stars, don't they? 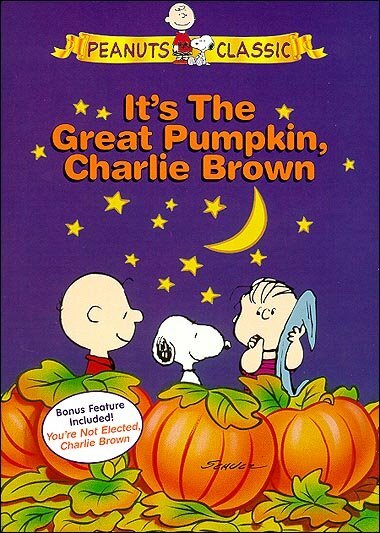 Oh, Great Pumpkin, Where are you? Well I think so and it's Monday so I can like what I want. The Witch came flying by, Whew! And make a Pumpkin Pie! That was a song my daughter learned in Nursery School. You're supposed to count down on your fingers while you 'whisk away the pumpkins'. My mother is the only person I know who can make REAL pumpkin pie by stewing a pumpkin and not buying the pumpkin in a can. 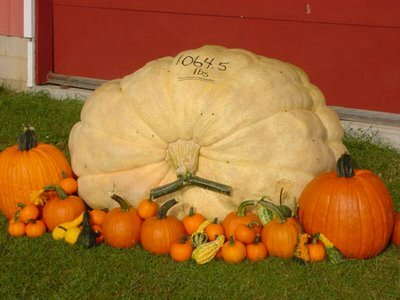 Do you know that you need to buy a special kind of pumpkin for a pie vs. the carving kind? They're smaller and sweeter. 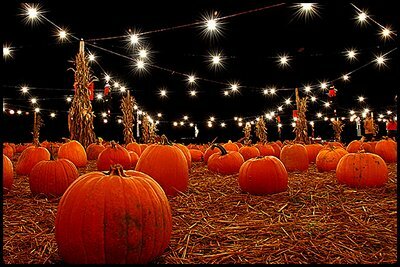 Anyway, I'm prattling on about pumpkins... It's not long now till Halloween! I am bringing in a plastic trick-or-treat pumpkin to work today, filled with pumpkin-paper individually wrapped pretzel packages. More cuteness! Please ignore all the bills, coupons, flyers and paperwork piled on the counter next to them. I should have moved that stuff, shouldn't I? Sorry, I haven't bought any chocolates yet. I'll buy some just before Halloween to give away. I'll get moans and groans from the folks at work (who prefer biscotti, by the way), but I think they're cute. 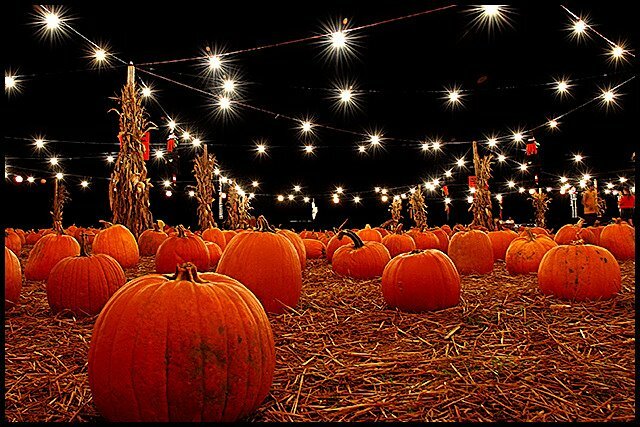 Anyway - gotta 'roll on'... That's pumpkin talk, folks! TTFN! Day 244 - The Prodigal Noodles Have Returned! It is truly a remarkable and memorable day. The long lost noodles have returned, safe and sound! Debbie and I went to swim yesterday, and another health club member I know (N) was there. (No, the photo is not of HER, but the noodles are that color). She spoke to me and told me she had seen me leave my noodles at the pool, so she stuck them in her car for safekeeping until she saw me. She didn't swim last weekend, so she didn't see me until yesterday. That's the long and short of it (I said that because of the noodles). Hooray! Hooray! My noodles are back, my noodles have come home! Hooray! You see, I've got the noodles incorporated now into my exercise routine, and without them it is back to 'swim around and like it'. I've made up my own series of resistance exercises WITH the noodles, and as you know, I didn't have a backup. Oops. Sigh, all is well with the world again! I even made noodles for supper last night, with a ham steak sprinkled with cinammon sugar, and buttered peas, and applesauce. Heavenly!!! Quote of the Day: This quote is from a Dane Cook comedy routine, where he describes a fight over nothing between a man and a woman in the kitchen... Expletives deleted. You might not think this is funny, but if you've ever been around some jerk ball who acted like this (and a lot of us have), it is HYSTERICAL. He must be from Rhode Island. We come in "Oh yeah, you're just gonna eat * noodles. Is that what you're gonna * do, just eat * noodles on your * . You're just gonna sit there uhhhh. You're *, yeah. And eat * noodles, is that what you're gonna do? Eat the * noodles? Yeah. Well, who bought the * noodles? WHO BOUGHT THE * NOODLES? Just tell me who bought the noodles and I'll leave you alone! I did, that's right, I bought the *noodles! Enjoy MY * noodles! That I * bought, every box, MINE! I * bought them. Hey, you know what? I * love noodles and I've loved them my whole life! I loved them, you know why? You know why I loved them? Because when I was a little boy my dad used to buy me all the * noodles I wanted, he bought me all the noodles, if I said "Daddy, I want some noodles" he * bought them and you know why he bought them because he's a SMART * GUY. Evil Bloggyman: I love that guy. Everyone else - have a great day and enjoy YOUR noodles! Greetings, Bloggy Princes and Princesses! Happy Saturday! 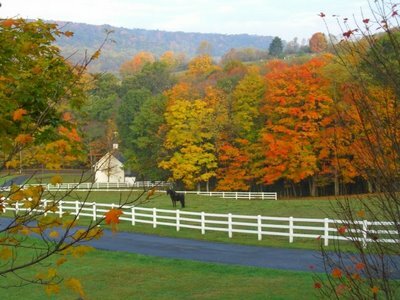 I chose this photo from the web this morning because the fall foliage here is looking pretty nice right now. I am surprised because it was such a drought-ridden season here. I put a flannel bottom sheet on the bed last night - it is 32 degrees this morning. One flannel sheet on the bottom means the bed isn't cold when we get into it, but without a flannel top sheet it isn't as hot! The word 'flannel' reminds me of the book 'A Little Princess', when Becky made Sara a pin cushion out of old flannel, and apologized for it. Sara loved it. Becky had scarcely known what laughter was through all her poor, little hard-driven life. ... "It ain't nothin' but flannin, an' the flannin ain't new. Who would I be today if I hadn't read 'A Little Princess', and 'The Secret Garden', and the 'Little House' Books, and 'Nancy and Plum', and a hundred others? I guess I'd have turned out okay, but I'm not sure! Males don't usually read those books, and look how they turn out! Kidding! By the way - when are they going to make an ACCURATE movie based on 'A Little Princess'? There's one version I saw a little of on cable, and it is WRONG, WRONG, WRONG. There's a Shirley Temple version, but the Shirley Temple movies are too 'Shirley Temple-ey'. Ah well, it's too early in the morning to wonder such things, and I'll bet YOU don't care? I'm meeting Debbie to go swim later this morning, and Charlie's out in the hunting blind. I'm having my bloggy juice here, then breakfast, then I'll hit the road. "Flannel keeps us warm. Flannel keeps us equal. Flannel keeps us constantly aware that we aren't basking in the warmth of a southern ocean breeze. That's why flannel is the enduring Canadian fabric."Well . . . that's what I think, eh?" TTFN and have a nice day! Get out your flannel shirts and Go, Go, Go! No, I have not bought a pumpkin yet, it is certainly cold enough to keep one outside now - it's 42 chilly degrees outdoors. I have a bug fix to do at work this morning, and I have to admit it's a bug with my own code! How aggravating is that? I'd rather fix other people's mistakes. I might even go in a little early, because I want to find it and fix it so I can have peace of mind this weekend. I'm not going to write for long so I can get ready a bit earlier than usual. I do have to make a 'food choice' comment. Last night on Survivor - they had a very physical challenge, playing for a 'feast' reward prize. 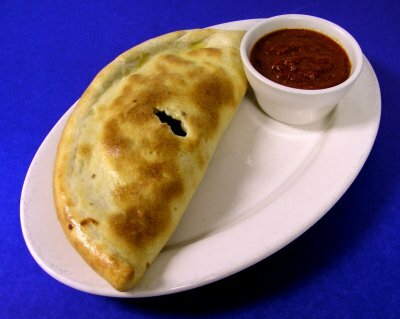 When I think of people from the US who haven't had fast food, lattes, chocolate, spices, etc for days, I'm thinking the best thing they could possibly reward them with would be pizza and beer, or burgers and fries, or spaghetti and meatballs, or mom's apple pie, or something along those lines! So what do they come up with? A pot of stewed lamb shanks, and bread. What the heck is THAT??? They've lived on fish, snails, octopus, fruit and water for days! What consultant thought that brilliant meal up? Did the Lamb Council petition the show and complain that they'd never seen lamb served on Survivor, only chicken and beef? Did someone decide that beef and pork were taboo, and so chose lamb? Did the crew sit around 'tasting the options' like you do at a reception hall, and choose lamb shanks? When I think of the word 'Lamb Shanks', I think of Samwise Gamgee trying to protect Frodo Baggins from Strider (Aragorn) the first time they met. Do you ever wake up in the morning and look in the mirror, and wish you hadn't? Does it ever look like some creature has been rearranging your EYEBROWS while you slept? Does it look like the bags under your eyes have turned into Mountain Crevasses, sans goats? Do you wonder needlessly about whether your hair has split ends or is falling out, because you can't do anything about it anyway? 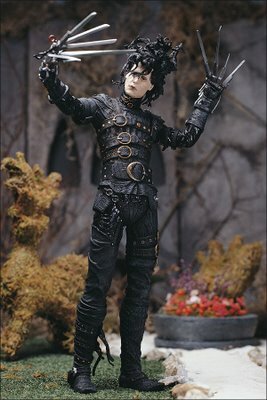 If I'm having a 'bad face day', I can look at ol' Edward Scissorhands and feel quite sophisticated. Hey, Edward, be a good sport and carve my pumpkin this year? I'll bake the pumpkin seeds for you! I guess I should buy a pumpkin and make pumpkin seeds to bring to work for people to try who have never had them! Maybe I will and maybe I won't. These faces in the mirrors are but the shadows and phantoms of myself. Josh Blue, the 'Last Comic Standing' guy who we thought was really funny, is going to be in Nashville this weekend at Zanies Comedy Club. I don't think we'll go, but we'd enjoy it if we did! It was in the 80's yesterday but won't get out of the 60's today. 70% chance of showers. Whassup with that? HEY! Mama Nature! Bring back the warm weather! TTFN Folks - have a nice Thursday! 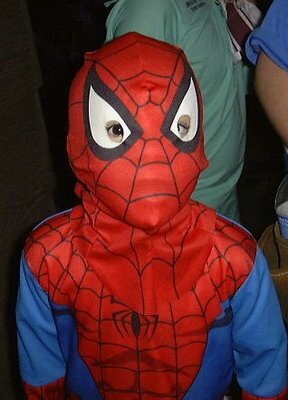 Here's our Halloween poster child of the day. I was in the ladies room at work yesterday (sitting down, minding my own business of course), and a terrifying, attack centipede came scurrying right at me! It knew I was in a vulnerable position and chose that moment for a multi-legged offensive. I am proud that I didn't scream. So... I stuck out my foot (from my seated position)and stamped on it. Sorry, PETA. I mentioned the other day that Charlie had 'company' at his deer blind when a deer came to visit him, eye to eye! Well, yesterday he made another new friend - a Carolina Wren. Charlie had to look it up in the bird book to find out what it was. 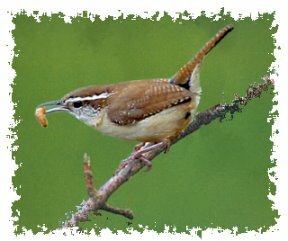 A Carolina Wren (Thryothorus ludovicianus) is the official state bird of South Carolina. It is about the size of a sparrow and is dark rust brown on the back with some rusty areas. The throat is white and it has a prominent white eye stripe. It obviously didn't have any fear of him, and wanted to hang out in the blind too and watch for deer (and bugs). The little wren came to the 'window' of the blind first and perched there, checking the place out. Then he figured that since Charlie had a bow, he couldn't be hunting birds, so the wren flew over to Charlie, who had his bow in his LAP, and perched ON HIS BOW! Can you believe it? Well, those are all our nature stories from yesterday. Have a great Wednesday and TTFN! Day 239 - So long Monday, Hello Tuesday! Monday night report: Our Monday night trip to Cracker Barrel with some friends went just fine. What kind of candy do you give out for Halloween? We don't get many trick or treaters here, just the next door neighbors kids. I have a tub of UTZ Halloween pretzel packs that I got at Sams Club, but I'm bringing those to work. I'll get a bag of chocolates for the neighbor kids. Maybe I'll buy some full-sized candy bars. They were always my favorite when I was a trick or treater (or a parent pilfering from my kids stash). 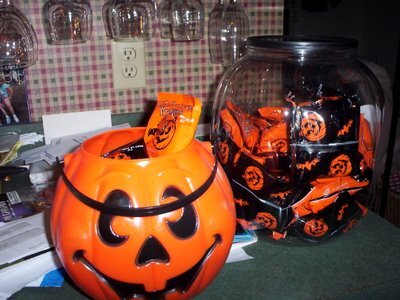 A few Halloween memories - getting enough candy to make the bottom of a PILLOWCASE heavy. Wearing/eating those awful wax-candy vampire teeth. YUCK! The taste of candy corn is burned into my memory forever. I'm not crazy about it but some people are. UNICEF boxes. Do kids still do that? We never counted the money because the box couldn't open, but we were always curious. A lady at work mentioned she gave out dollar bills one year because she didn't have any candy. The kids loved it, then told other kids to go to her house, so she had more trick-or-treaters than usual! 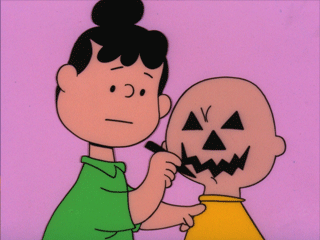 Well, sorry gang - I've got a couple weeks left to talk more about Halloween, and right now I've got to get ready for work. Have a great Tuesday! Many of you know that 'Aunt Nancy', who posts a lot to this blog had just recently left on a 10 day vacation in Hawaii, where they just had an earthquake. She let my mother know that she is fine, but was awakened yesterday morning to her room shaking! Her hotel was not damaged, but they have no electricity. Not exactly the way I want my VACATION to play out. Come home safely, Nancy! It's supposed to be windy, rainy and cool today. Perfect for a Monday if you ask me. The photo I was planning to use for today's blog isn't uploading. What the ^%$#& is up with that? C'mon Blogger, get it in gear. Ok, after about 5 attempts, it loaded my 'punkins'. I’ll get to you, Rudolph, don’t worry your pretty little nose over it. 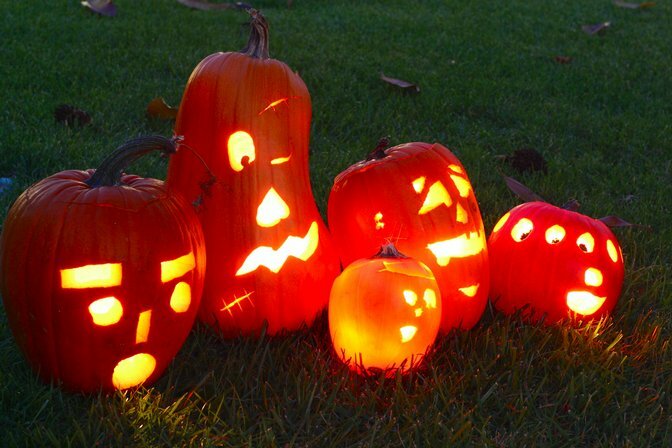 Aren’t these jack-o-lanterns the gnarly-est dudes you’ve ever seen? One even has a black eye and scars! The one with scars (Frankenpunkin), and the one obviously modeled after an alien with eyeballs everywhere are my favorites. ;-) Earthling, take me to your chocolate! Until October 31st (or later) I’m going to have to stick with the Halloween thing. There are too many cute photos on the web to steal and talk about on ‘da blog’. 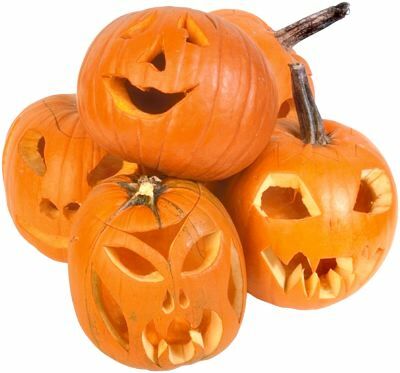 Can you believe that someone at work had never cooked and eaten the pumpkin seeds after carving the pumpkin? They didn’t even know HOW to. I am in shock. I'm going out the door to swim. Love you bye! More later but I don't know what time. I used a new machine today at the post office, that walks you through various menus to weigh your package, accept a debit/credit card, and prints a package label that has the postage and the city/state/zip on it. (you tell it the zip code to get the postage amt). It worked very nicely, except the label is quite large and I had already addressed my package. It didn't matter tho. BLOGOCIDE: Death of a blog under suspicious circumstances, like 'My mom won't let me'. BLOGICIDE: Bloggy suicide - saying stupid stuff on your blog that makes you wish you were dead. Greetings, Bloggy-eyed and Bushy-Tailed Readership! Is your Halloween costume ready? I grabbed this photo from the web. Check out the kid with the jeans and t-shirt on - his costume is just some black eye makeup. He must be impersonating Johnny Depp! His pumpkin carving looks like a hand flipping the bird. Apologies for that. And right next to him is someone who is WAY too old to be in that group and apparently thinks it's all right to dress like a COW. Bad choice, dude. Not cool. How fast the morning goes by when you don't get up until 6am.! I'm chug-a-lugging a cup of coffee before I hit the road to go swimming and look for my long-lost noodles. I don't expect them to be there, but you never know! Charlie has already gone to go sit in his deer blind or up in a tree. I didn't really expect they would still be there. Serves me right for leaving them, and my mother has promised me one when I see her in December. YES, I did get a winter coat. Several different stores are running a half-price sale on winter outerwear at the moment, and I looked at several stores before I found THE ONE. I didn't want to spend a lot, since I don't even LIKE to wear a coat, but need one for really cold days. I got a reversible, one side black waterproof and one side warm-as-toast gray 'stuffed animal soft' material, lots of pockets, zippered and hooded jacket. That will get me through the winter just fine. AND most importantly, it is black and gray, which matches the scarf that Heather knitted for me with her own little hands. It was $70 marked down to $35. Thank you very muchy, Sears. Charlie and I ate lunch around 1:30 - kind of late for lunch, eh? I've got housecleaning to do, so TTFN again! Day 235 - Friiiidddayyyy thhheee 13th! Eeek! It's that scary ol' Friday the 13th! I think when Friday the 13th comes around in October, Halloween should be TONIGHT. All the grownups could scare the kids that come to the house. I would never do that, but the thought is funny! HAPPY BIRTHDAY, GILBERT! Don't be 'afraid' of another year older! Well, DUH! Everyone knows THAT! It is a bone-chilling TWENTY-EIGHT degrees here - one of the earliest hard frosts we've ever had. Keep that Canadian air up there in Canada, please! Charlie tells me he had a 'scare' yesterday, but an exciting one. He was in the 'outback' sitting in his hunting blind on the ground, and dozed off. He woke up, hearing a noise, and peeked outside. CHARLIE WAS EYE-TO-EYE WITH A BUCK DEER WHO WAS RIGHT OUTSIDE HIS BLIND! Charlie startled, the buck startled, the buck mooned him (put his white-flag tail up in his face), and took off! Charlie said that is the closest he's ever been to a deer - he could have reached out and touched it, he was so close. 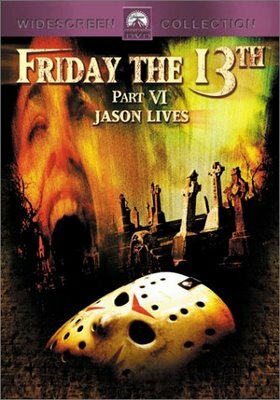 I have a couple meetings today on Friday the 13th - I don't know if scheduling those was a good idea or not! I have 'presents' for my attendees - Halloween pencils I got at the dollar store. I postponed a test run of something scheduled for tonight - no reason to tempt fate. Last comment - the only good thing about cold weather is I'm going to shop for a new winter coat. ;-) Looks like I need one, maybe a parka! TTFN! Be careful! Greetings, Bloggy Outbackers and Outhousers! Evil Bloggyman: No, I won't play *^%$# potty monster, GET LOST! I've been meaning to tell you a couple of things about the women's restroom where I work (why, you ask? ), and just never had the right opportunity. Well, today is IT. First of all - when I walk in and the cleaning people have recently been there, it smells like red lollipops. Don't ask me what scent they are using, but that is the EXACT smell, and reminds me of doctors offices and trips to the bank (when they used to give out lollipops). Second - the soap dispensers shell out radioactive-looking liquid neon pink double-bubble bubblegum goo. It collects on the counters in between cleanings. 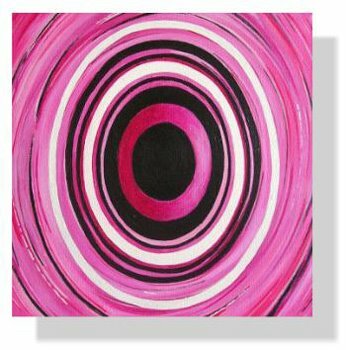 It is shockingly pink and shockingly obvious, forming little lakes and puddles on surfaces, and sometimes underneath the sink (where the dispenser bottles are) on the floor. Eeek! We've been invaded by retro-blobs! What is the purpose of THAT? To be able to see when the soap is low? If liquid soap can be ugly, this is HIDEOUS. Third - the commodes are so water-saving they don't flush. Great design, someone. If you don't flush at least twice (or more), you have confetti at the bottom of the bowl. Fourth - the door to the restroom is very heavy, and you could knock someone out pretty easily if you open it suddenly. You have to turn a handle, it doesn't just push open. Well, that pretty much sums it up. You really wanted to know that, didn't you? Have a nice Survivor night, I highly recommend having pizza, and TTFN! Oh - by the way - I just had a 90-day review at work and today I have another one for end of quarter. Wish me luck! I made that word up. I also thought I made up 'The Hungry Blogger', but someone already has it. Curses, foiled again. Charlie's ankle is still turning pretty colors, and so are a couple of his toes. Poor thing! My mother called it 'foliage', and I guess she's right - bruise foliage. Good word games this morning. Here are some flowers from the Nordic Lodge for Charlie and his ankle and his foot and his toes. I dreamed last night of a resort that offered luxury treehouse villas. They were 367 dollars a night, and I didn't spend the money but I was surely tempted to. That sounds like me! He was shaking his head and saying they had changed the store around and he couldn't find anything. 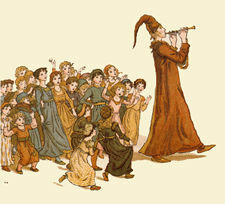 I'm going to play a little medication music from 'One flew over the Cuckoo's Nest' and see if you come to it like the Pied Piper of Hamelin Town. Oh Nurse... Nurse! It's time for me to rock and roll... Play ON, dude! Play on! It's Tuesday! Monday is behind us for another week. Yesterday flew by but I can't really put my finger on WHY - must be losing my marbles. 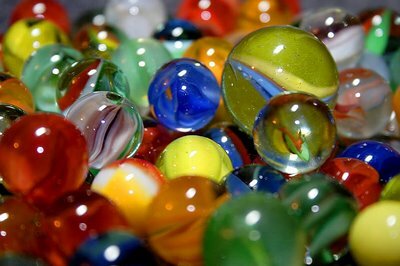 By the way - aren't marbles BEAUTIFUL? How did someone invent a common kids toy and game with objects that are works of art? Gorgeous things, marbles. It makes me happy just to look at marbles, and handling them is even more fun, like polished stones. Our weekly dinner out at Cracker Barrel last night was great - all four of us polished our plates and palates. I had grilled chicken tenders, salad, carrots and applesauce. Charlie had roast beef and gravy with corn, green beans and fried apples. YUM-O! Confession: I am getting old and forgetful since I've lost my marbles. I've also lost my noodles - my pool noodles that is. I left my noodles (I had cut one of the long ones in half) at the pool on Sunday and I'm sure they won't be there when I go to swim next Saturday. 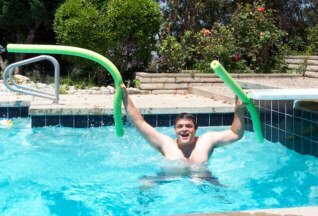 Readers - anyone have a pool noodle they want to part with - permanently? Let me know, I think the stores don't carry them this time of year. Dream Update: I dreamed of rainy, stormy weather and waves - not tidal waves though. There was some kind of rescue mission or training in progress and an inflatable rescue boat and all their gear was laid out in a big room. There's a movie out right now starring Kevin Costner with a similar theme. I need to go see it. Well, I'm done blogging early today because I didn't need to make Charlie's lunch - he has a luncheon to attend today, the lucky dog. His ankle is starting to turn pretty colors but it's feeling OK and he's being careful with it. TTFN and Blam! I'm outta here! Greetings, Bloggy Spritzers and Bloggy 'Youze-Urpers', it's Monday! Isn't this an awesome piece of artwork I chose this morning? 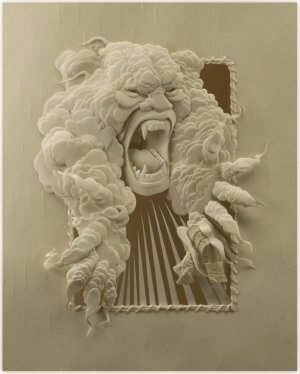 It is 'paper sculpture', unbelievable. It's supposed to be 'Old Man Winter', but you'll see that it fits in with what I am going to talk about. Appropriately for a Monday, I'll tell you a true story about something that happened yesterday. I went swimming, then drove to a cafe called 'The Coffee Beanery' to get a nonfat Cappucino. Yes, you've noticed I've been consuming a lot of coffee lately - must be the change in the weather. The person who makes the coffees there had recommended I try a 'Skinny Cappucino' instead of the latte I usually get, because supposedly a Cappucino has more foam. That's what I like, by the way, the foam. With coffee in hand, I then proceeded to the bank to go through the drive thru and get some fast cash. Around that time, I took a gulp of coffee, and some of it went down my windpipe. I realized this was going to be a problem, but there was nothing I could do about it. I SPEWED the coffee - over my sweater, over my lap, over my steering wheel, and over my dashboard. I was the human equivalent of a spray bottle. Oops. I actually had to laugh out loud, thinking how funny it probably looked, but thankfully a few dabs with a napkin and no harm done. I was wearing a dark colored sweater, another reason to be thankful. Evil Bloggyman: You did it on purpose, to have something to write on this stupid screen. Nope, I didn't mean to. I wouldn't deliberately violate my person and my vehicle for a blog. Anyhow - that's my big incident. I will be 'way careful' in the future when drinking cappucino. Last announcement - a 'get well' to Charlie who twisted his ankle a bit yesterday. He is kind of limping around this morning with a swollen ankle. Get Better, Charlie! TTFN and be careful, whatever you do! It's Sunday! One more day till M**nday, the unmentionable. Charlie and I had a delicious birthday dinner out last night at Texas Roadhouse in Cool Springs. They serve baskets of hot yeast rolls (I had three), and Charlie and I had pretty much the same thing in mind for food. I don't know why this photo I chose has all that white space at the bottom, and I don't have time to go find another one. Your patience and understanding is appreciated. We both ordered the 16oz cut of prime rib, we both had a salad, and Charlie had a loaded baked potato and I had a baked sweet potato. By the way, I might not have mentiond this, but I have a prime rib addiction. We devoured nearly everything - I brought home some of my prime rib with some extra rolls I sweet-talked the waitress into providing. 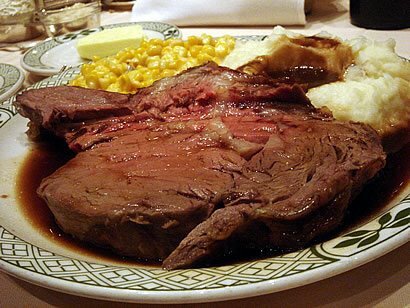 I'm going to go out the door in a few minutes, go swim, go to the grocery store, and come back home for a nice Sunday afternoon and my leftover prime rib! YUM! You have a nice day and TTFN! Day 229 - Saturday! Hooray! It's Saturday! It's 44 chilly, fall degrees this morning, but my mother in Maine reported that it was TWENTY TWO DEGREES there yesterday morning. That right there is COLD - that'll frost your pumpkin and freeze it solid. Ay-yuh! It's only 6am but Charlie is out sitting in a tree in the back, so I am going to slog down a cup of java and go swim. I have only been swimming on the weekends, so I have to get 'up and at em' before the pool gets busy. This evening we're going to go out to dinner to Texas Roadhouse for the first time - everyone I know who has been there liked it - so that is where Charlie chose to have his birthday dinner. Have a nice day everyone! TTFN! Greetings, Bloggy Sleepyheads! Oh, that's me. It's FRIDAY! Yawn... Friday! Sleep in a circle. Even looking at photos of yawning made me yawn. Charlie slept over at his buddy's fishing camp last night so they could spend the day today fishing. It's supposed to be WINDY today so I'm a little concerned for his sake. Slept on Charlie's side of the bed where the alarm is. Woke up at 3:30am for a while and thought about something I'm doing at work. Got up half an hour later than usual. Shuffled to the kitchen where the laundry room is to get the towels I washed and dried yesterday out of the dryer so I could get in the shower. Made my own pot of bloggy juice. Absentmindedly stopped in at the guest bath to jiggle the handle of the commode, which has a 'trickling' bladder control problem if I were to listen to the TV ads. Haven't made my lunch yet. P.F. Changs chow mein looked more like lo mein to me but what do I know? By the way, they have great decaf coffee, and I've never thought ANYONE's decaf coffee was good except maybe some Green Mountain Roasters decaf I had this summer. (Yes, organic coffee). Eeek! It's almost quarter past 6 which is my signal to 'STOP BLOGGING'. I need an alarm. Dream update: The other day I had a dream with my maternal grandfather and my paternal grandmother. We were all at a conference and I was carrying my grandmother's purse while also trying to carry stuff for my grandfather. What was THAT about? TTFN! Have a great FRIDAY! Day 227 - Happy Birthday, Charlie! Is it YOUR birthday today? We can all wish Charlie a happy birthday, feel free to post 'birthday stuff' in the comments. Charlie got a card in the mail (thanks, Mom!) and some of his presents last night from me, then he's had two presents and another card this morning. 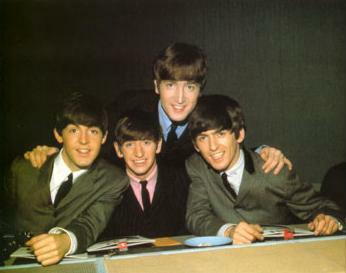 Today's birthday song lyrics are by the Beatles, of course!!! Yes we're going to a party party. Some of my regular Bloggy contributors would like to wish Charlie a 'Happy Birthday'. Doc Bloggy: So, Charlie, how do you FEEL about your birthday? Make an appointment with my receptionist and we'll discuss it. Evil Bloggyman: I don't give a &*%$# about your %$#@* birthday, bud-ro. The woodpecker that pecks on the roof: Play sound clip of jack hammering. The turkeys out in the yard: Play sound clip of Charlies turkey call and them answering. The deer in the woods: Play sound clip of nothing, they don't make noise. You get the picture. Have a great day everyone, and Happy Birthday, Charlie! Greetings, Bloggy Heel-Toe-ers and High Steppers! Midweek already! We're well on the way to the Weekend! I had a cluster of little holes on the bottom of one heel. What is that condition called? 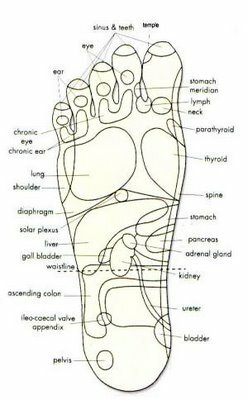 Sieve-foot? Pincushion-itis? 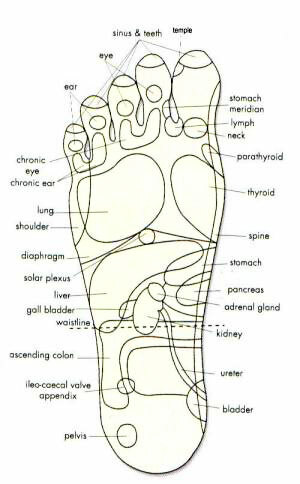 The image at left is a reflexology map of pressure points in the foot. Isn't that interesting? Looks like my problem may actually be in my pelvis, eh? No comments, please. Doc Bloggy - What do YOU think? Well, Karen, what I think isn't important. It's how you feel about your dreams that is significant. But I am not a physician, so if you have gross, disgusting heels in your dreams I can't do anything but talk to you about it. That'll be $150, please. Logophobia - The Fear of words. 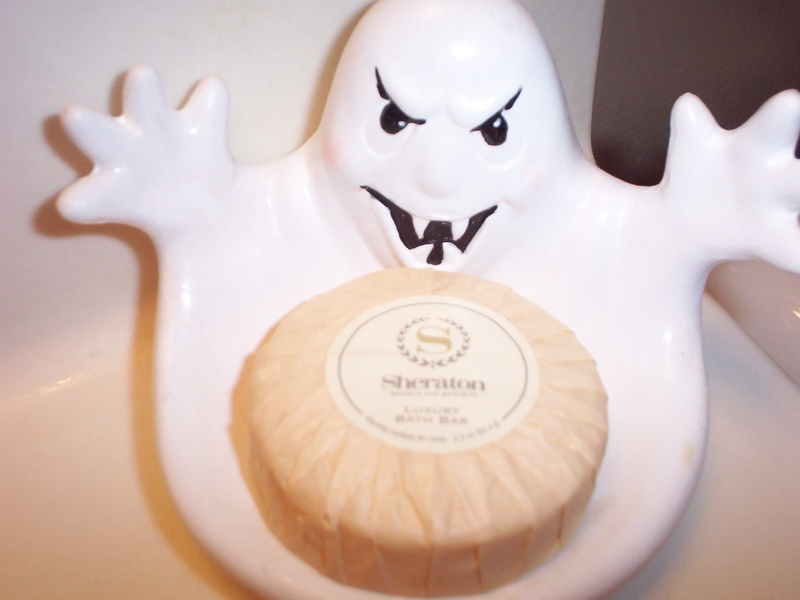 Greetings, Bloggy Ghosts, Ghouls and Goblins! 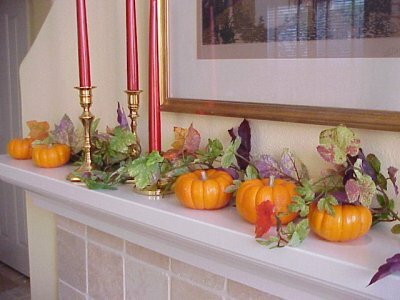 Here is another picture of my guest bath seasonal decorations - these are votive candle holders that I bought at the end of last season for .25 apiece. CUUUUUTEEE! Charlie and I had a GREAT dinner at Cracker Barrel last night with our friends - the portions were bigger, the food was excellent, and our waitress got our teas and order correct. I am slogging down some coffee this morning with a little Irish Creme flavoring added to it. Mmmmm. Phobia update: In honor of October, I'll list a phobia whenever I'm in the mood. The things that people are scared of! Arachibutyrophobia- Fear of peanut butter sticking to the roof of your mouth. Can you believe they need to have a NAME for that? Call it Skippyitis instead! 'I got to thinking about relationships and partial lobotomies. Two seemingly different ideas that might just be perfect together - like chocolate and peanut butter.' Sarah Jessica Parker. It is definitely fall, by the way - I can SMELL it. There's a leafy, smoky scent in the air, warm days and crisp nights. I like it! Autumn here in Tennessee means less humidity, cooler days, and comfortable nights. Very nice. Closing comment - I am outraged and disgusted to hear that a gunman in Pennsylvania Monday took the lives of several innocent Amish children in his quest for dramatizing his own death. Why can't these people remove themselves from society without taking others with them? Day 224 - Scary Things - Like Drivers! This photo is of my Halloween soap dish in the guest bath - isn't it Soooo CUUUUUTTTEEE? Gush Gush. I was in line last week next to someone buying a few Fall decorations for their house - $60 worth. Ouch! Hey - speaking of fear - there's a real condition named Bogyphobia- Fear of bogeys or the bogeyman. If I add an 'L' to make it Blogyphobia - it could be the fear of the Evil Bloggyman! Whoa. Yesterday Charlie and I took a drive to find the 'local' (only 10 miles away or so) library. On our trip - we passed someone who had lost their way and needed to turn around. OK, it happens, no problem. Instead of turning around in someone's driveway, this big SUV bypassed the driveway and drove up onto someone's pristine, newly seeded and hay-strewn LAWN and turned around on their grass!! We were so shocked we forgot to see if they left big ruts on the new lawn. How ignorant was THAT? Bad choices, bad driving. Yesterday, I was passed on the highway by two cars from West Virginia, speeding. I know they were speeding because they were behind me for a minute or less. I was going almost 80 and they came around me and passed me effortlessly. There was no reason at all to pass me, because where they needed to go was the right hand lane to EXIT. They got there so late they had to cut in front of other cars and each other to GET in the exit lane. If they had moved over without trying to pass everyone on the road first they would have been fine. Bad choices, bad driving. Well, have you heard enough complaints for today? 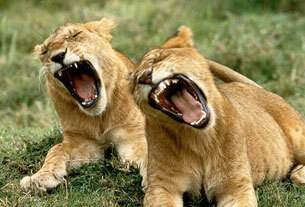 Have a nice Moan-day and TTFN! Day 223 - It's Blogtober! Or is it Bloctober? Greetings, Bloggy Punkin-Eaters! It's Blogtober or Bloctober, I can't decide which I like better. Anyway, I'm just saying Hi - Charlie is making coffee so I am posting a quick note before it's ready. I'll write more after breakfast. I do have time for one story (or premonition!) - remember last Tuesday's Blog when I had dreamed about bees? Well, I went to the car wash yesterday, and while I was waiting for my car to go through, I felt a tickle on my neck. I reached back and felt a bug - I thought it must be a Japanese beetle because it was pretty big! I cupped my hand around it and threw it out the window. It landed on the pavement - it was a BEE. A yellow jacket, very similar to the bees in my dream! EEEEK! I'm glad it didn't sting me on the neck (vampire bee), and I'm glad it didn't sting my hand either. Must have been a little bit of my dream, come to haunt me! More later, including my visit to the first DUNKIN DONUTS in Cool Springs! Awesome! It's mid-afternoon, and I've had a nice day. 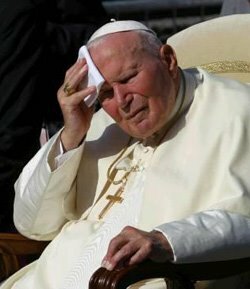 It is 77 degrees outside, and for the next week it is supposed to be in the high 80's every day. Wish the pools were still open outside! I wanted to mention my expedition to Dunkin Donuts in Cool Springs on Saturday. I knew a Dunkin Donuts was opening, because I spoke to someone on my plane while I was on vacation who was assisting with the opening. I didn't know exactly where it was, either. I have been very excited about it. It's not far from my grocery store and the factory card outlet where I get my discount greeting cards. Anyhow, long story short, I had a lovely large latte' lite (nonfat latte) and it tasted just like it ought to, and I also bought a pound of french vanilla ground coffee to bring home with me. I phoned several people from my car just to tell them that I was having a Dunkin Donuts coffee here in Tennessee. I have missed DD very much here - I even have a Dunkin Donuts christmas ornament, for Petes Sake! Trust me, I had to talk myself out of going right back there today and having another one. YUM-O. I had a lovely swim, by myself for most of the time. I stopped at Sams Club and then Charlie and I went for a drive to Spring Hill, Tennessee so I could find their library. I've lived out here for 4 years and haven't gotten a library card out here yet. I'll rectify that situation soon! Well, I'd better rock and roll - more tomorrow! TTFN!